If you polled a group of people and asked them to define the word “quality,” you would probably get mixed responses. Most people have a good idea of what quality means to them, but it is not as easy to define quality in terms that would include everyone’s interpretation of its meaning. For some words, especially those that deal with abstract concepts, a bit of ambiguity is fine. However, when an assessment or judgment of the quality of a tangible item or activity is necessary, more explicitness is required. Medical devices are probably the most critical electronic systems developed as they are used to preserve or enhance lives. This level of responsibility mandates that these systems adhere to well-defined regulations and standards to ensure they are able to perform their intended functions with no injury to patients. One of the most important of these standards is ISO 13485, which defines how to manage the quality of medical devices throughout their life-cycle. This includes explicit quality management system (QMS) requirements for organizations involved in providing systems and services to the medical device industry. As adherence to the ISO 13485 standard is mandatory, a good understanding of its intent and content overview is necessary. With this information, specific provisions that impact the PCB design and development process can be further explored. ISO 13485 is an international standard intended to reassure organizations purchasing and utilizing medical devices that the developers and suppliers of these devices have instituted and implemented a QMS that meets certain minimum requirements. 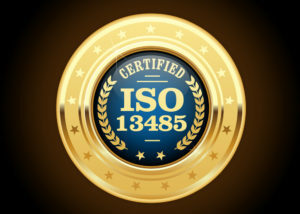 Suppliers and developers demonstrate their compliance and commitment to this level of medical device quality by becoming ISO 13485 certified. If a company or entity participates in or provides design and development, production, storage, distribution, installation, servicing or other technical support, their related operations most likely fall under the QMS standard. The major requirements are listed below. Obviously, ISO 13485 is quite detailed and provides a clear roadmap to be in compliance and obtain certification. You should establish an open, transparent white box relationship with your CM from day one. Communicate openly with your CM and promote the free flow of data and information, especially customer requirement changes. Get access to DFM guidelines tailored to CM equipment capabilities. In conjunction with your CM, institute methods to avoid counterfeit components and component shortages. Enlist your CM’s support in tracking materials and components, performing or aiding in testing requirements and collection of pertinent data. Your ability to fully comply with the spirit, as well as the regulations, of the ISO 13485 standard is best supported by the optimization of your board fabrication, component selection and PCB assembly (PCBA), which requires selecting the best CM. Works with 4 of the top 10 medical devices manufacturing companies. Accurate quote in less than a day. DFM support from Day 1 of design. Fastest turnkey PCB manufacturing in the industry. Rigid, rigid-flex and flex board capabilities for wearables and embedded biosystems. Custom automated BOM verification tool. Sources components from the most reputable suppliers in the industry. Standard quality testing, including X-ray and inline AOI. Superior open, transparent PCB manufacturing experience. Tempo Automation, is the industry standard for fast, precise high-quality PCB prototype manufacturing. In addition to quickly building your most complex and/or critical system designs, our agile manufacturing process is designed to identify and respond to industry, regulatory and customer changes quickly and as seamlessly as possible. And to help you get started on the best path, we furnish information for your DFM and enable you to easily view and download DRC files. If you’re an Altium user, you can simply add these files to your PCB design software. If you are ready to have your design manufactured, try our quote tool to upload your CAD and BOM files. If you want more information on ISO 13485 or how to ensure the manufacture of your boards supports your compliance with the standard, contact us.